Sleep disorders, including obstructive sleep apnea (OSA), have become a significant health issue in the United States. When left untreated, OSA can lead to high blood pressure, chronic heart failure, atrial fibrillation, stroke, and other cardiovascular problems. OSA is associated with type 2 diabetes and depression, and it is a factor in many traffic accidents. This article will provide a brief overview of sleep apnea, describe two closed claim studies that feature sleep apnea, and discuss ways to reduce liability when treating sleep apnea patients. Mild — an AHI between 5 and 15 respiratory events per hour of sleep. Moderate — an AHI between 15 and 30 respiratory events per hour of sleep. The diagnosis of sleep apnea begins with taking a careful history about symptoms of snoring or daytime sleepiness and an evaluation for the presence of other risk factors for OSA (obesity, increased neck circumference, abnormality of the airway). (4) Positive screening results should lead to a more comprehensive sleep history and examination. “OSA should be approached as a chronic disease requiring long-term, multidisciplinary management. There are medical, behavioral, and surgical options for the treatment of OSA.” (2) These include behavioral modifications, weight loss, and OSA-specific therapies, such as positive airway pressure, oral appliances, and surgery. 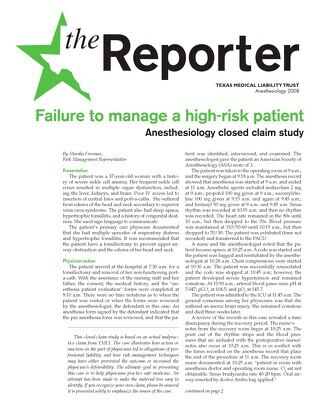 Patients with OSA are at a greater risk for complications during the perioperative period, including difficult airways, sensitivity to anesthetic agents, and postoperative adverse events, as the following closed claim studies illustrate. Following a sleep study that confirmed she had sleep apnea, a 41-year-old woman was referred to an otorhinolaryngologist (ENT). The patient weighed 200 pounds and was 5’2”. She had 3+ enlarged tonsils, bilateral inferior turbinate hypertrophy, 90% bilateral nasal obstruction, and an S-shaped deviation of her nasal septum. The ENT discussed treatment options, including continuing CPAP or surgery. The patient opted for surgery. Several weeks later, the ENT performed a uvulopalatopharyngoplasty (UPPP); tonsillectomy; a nasal septoplasty; and a bilateral partial inferior turbinectomy. The procedures were performed in an outpatient surgery center. The patient did well postoperatively. In the PACU, her initial O2 saturation was 96%. It went up to 100% after an oxygen tent was placed. The patient was given promethazine and 12.5 mg of meperidine. The anesthesiologist ordered labetalol for increased blood pressure. A second 12.5 mg dose of meperidine was administered. After 90 minutes in the PACU, the patient was discharged home. Her vital signs at discharge were documented as blood pressure 153/99 mm Hg; pulse 78; respirations 16; and O2 saturations of 91% on room air. Her post-anesthesia recovery score was 10/10. Two hours after her discharge, the patient’s brother called a nurse at the surgery center asking if the patient should use her continuous positive airway pressure (CPAP) machine. The nurse re-emphasized that the patient should use the CPAP machine and told the patient’s brother to contact the ENT with any further questions. Later that evening, the patient’s mother checked on her. The patient was snoring and not using her CPAP. 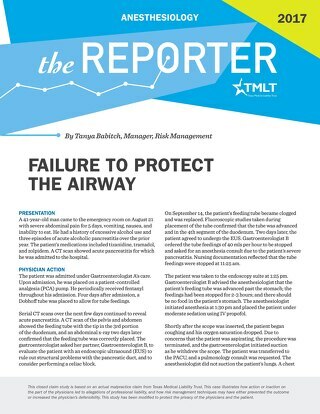 Her mother checked her once again in the early morning and found that the patient was unresponsive and was not breathing. EMS was called and the patient was taken to a local hospital. She was pronounced dead at the hospital. An autopsy listed the cause of death as cardiomegaly associated with hypertensive cardiovascular disease, obesity, and sleep apnea, recent surgical treatment with multiple sedative medications. The medications listed in the pathology report were hydrocodone, venlafaxine, and meperidine. Lawsuits were filed against the ENT and the anesthesiologist, alleging that the surgery should not have been performed in the outpatient setting and that the patient was not properly managed after the surgery. The defense had a difficult time finding expert support for the ENT’s decision to perform surgery in the outpatient setting. 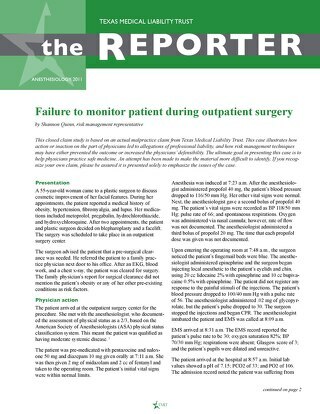 One ENT who reviewed the case stated that the outpatient setting was reasonable, but the patient required more extensive postoperative monitoring. 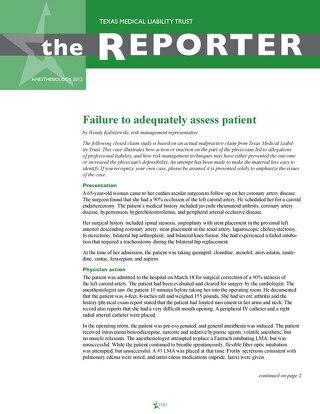 The patient’s discharge with a 91% O2 saturation was inappropriate. 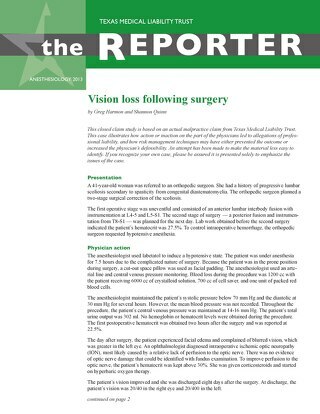 An anesthesiologist who reviewed this case indicated that the surgery should have been performed in a hospital due to the patient’s ASA 3 classification. He agreed the discharge was inappropriate and stated the patient required 23- to 24-hour observation at the surgery center or transfer to a hospital. The defendant stated he would not have discharged the patient if he had been aware of the 91% O2 saturation. A nurse testified that the O2 saturations were fluctuating between 91% and 94%, but only the 91% was documented. This case was settled on behalf of the anesthesiologist and the ENT. A 37-year-old man was referred to a pulmonologist for a polysomnogram. He was found to have an AHI of 129.5 and was diagnosed with severe sleep apnea. The patient reported that he used tobacco products and drank beer daily. He also reported using a CPAP machine during sleep. The pulmonologist referred the patient to an ENT. The ENT examined the patient and performed a laryngoscopy that showed floppy, redundant tissue in the arytenoid cartilage and medial aryepiglottic fold that collapsed with inspiration. 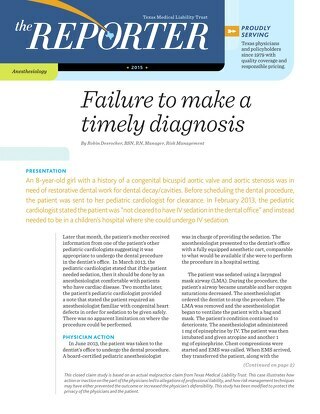 He diagnosed the patient with severe obstructive sleep apnea and adult laryngomalacia. The ENT recommended UPP and laryngoplasty. On October 1, the patient was admitted to a local hospital. The procedures were performed without complication. The patient was taken to the ICU where he was kept intubated due to airway edema. He was extubated on October 2, and his vital signs were stable. He was placed on BiPAP for respiratory support. The pulmonologist saw the patient on October 2. A chest x-ray showed a left lobe infiltrate concerning for pneumonia, and the pulmonologist prescribed an antibiotic. Throughout the early morning hours of October 3, the nurses documented that the patient continued to have a productive cough and thick, blood-tinged secretions. At 5:40 a.m., the nurse contacted the ENT to report the bleeding. No respiratory distress was noted until 7 a.m. when it was documented that the patient had coarse crackles and rhonchi in the lungs. The ENT saw the patient at 8:30 a.m. and noted that he was hypertensive and slightly tachycardic. The physician noted some mild bleeding from trauma to the palate as a result of suctioning. The patient was told to gently suction his mouth. The ENT gave an order to start the patient on lorazepem for his history of alcohol use. The first dose of lorazepem was given at 10 a.m.
10:15 he received labetalol. His oxygen saturations dropped to 82% on 4L NC. A respiratory therapist was called. The ENT was paged and while the nurse was speaking to him on the phone, the patient stopped breathing and went into cardiac arrest. A code was called. 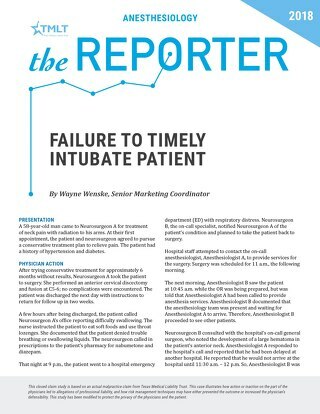 Initially an ambubag was used until the patient was intubated, approximately seven minutes after the code was called. The patient suffered an anoxic brain injury as a result of the cardiac arrest. He underwent a tracheostomy on October 6 and a PEG tube placement on October 17. He was transferred to a nursing home for further custodial care in November. 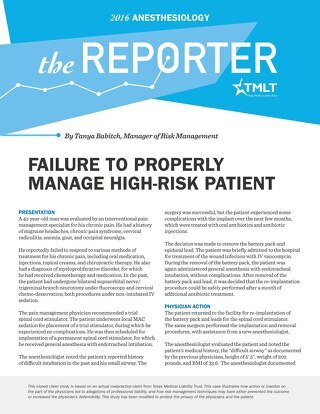 failure to educate the patient about the risks associated with the procedure. The pulmonologist was also sued. 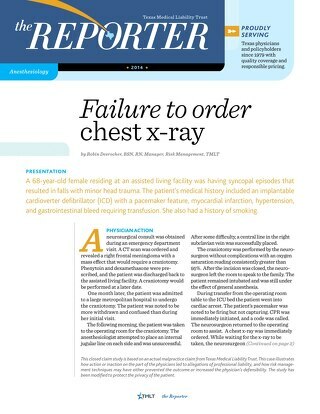 The allegations included failure to monitor the patient and failure to order appropriate medication during the postoperative period. The plaintiff’s expert criticized the pulmonologist for not recognizing the potential side effects the prescribed drugs would have on the patient’s respiratory status. He stated the administration of morphine shortly after the lorazepam was a “critical” mistake and caused the patient’s respiratory distress. Regarding the actions of the ENT, the plaintiff’s expert believed the UPP was overly aggressive. He stated that UPP is only used when a patient declines oral airway pressure or an oral appliance, or the therapy has been ineffective for three months. He was also critical of the ENT for not investigating and repairing the opened suture line in the patient’s pharynx. 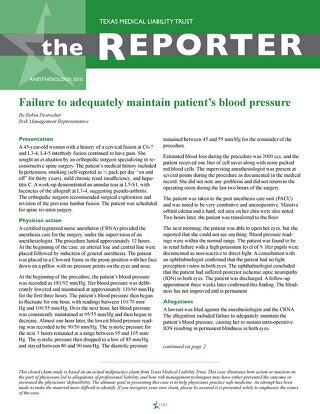 This expert believed the patient aspirated blood from the open suture contributing to the acute respiratory failure. Defense experts reviewing this case had concerns about sedatives given to the patient. When the patient developed postoperative delirium, the assumption was made that it was due to his alcohol withdrawal. This led to the administration of sedatives that exacerbated his condition. The combination of sedatives in a compromised patient soon after extubation can cause respiratory distress and may have been a factor in the patient’s cardiopulmonary arrest. Regarding the decision to proceed with the UPP rather than treat the patient with CPAP or bi-level positive airway pressure (BiPAP), the ENT testified that he discussed the options of CPAP and BiPAP and surgery with the patient. The patient wanted surgery so he would not have to be on CPAP for the rest of his life. During the investigation of this claim, it was discovered that a nurse used her judgment in giving the patient lorazepam and 8 mg of morphine at the same time. In light of this information, the cases against the ENT and the pulmonologist were dismissed. 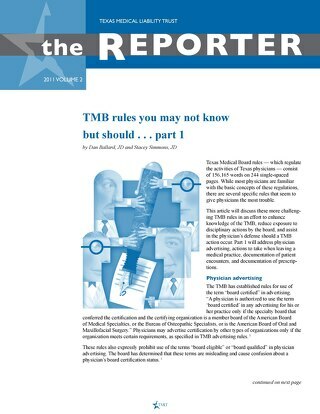 Physicians can consider the following guidelines to help reduce liability when treating patients with sleep apnea. If a patient is found to have OSA, ensure that everyone involved in the patient’s treatment is aware of the diagnosis of OSA. Patients who use CPAP devices at home should be advised to bring the mask to the hospital and to use it while in the hospital. Postoperative instructions should clearly indicate whether or not the patient should continue use of CPAP once discharged from the hospital. One issue is that multiple physicians may write pain medication orders for a single patient and they may not be aware of the diagnosis of OSA. One suggestion is to flag the records of these patients to warn of the risks of narcotics usage. 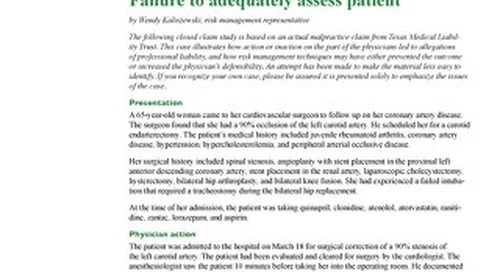 “While there may not be a consensus regarding the best and most cost effective methods to ensuring fewer perioperative complications from OSA, there continues to be a need for informed clinicians, as patients are typically presenting with undiagnosed or misdiagnosed cases.” (1) Awareness of the risk factors and complications associated with OSA, along with adherence to applicable guidelines, can help enhance patient safety when treating patients with OSA. UC San Diego School of Medicine, University of Toronto. Perioperative management of OSA Patients. April 2011. Available at http://cme.ucsd.edu/OSAonline. Accessed January 18, 2013. Kingman PS. Overview of obstructive sleep apnea in adults. UptoDate. July 3, 2012. Available at http://www.uptodate.com/contents/overview-of-obstructive-sleep-apnea-in-adults?source=search_result&search=sleep+apnea&selectedTitle=1~150. Accessed January 18, 2013. American Sleep Apnea Association. A very short course on sleep apnea. Available at http://sleepapnea.org/i-am-a-health-care-professional.html. Accessed January 18, 2013. Adult Obstructive Sleep Apnea Task Force of the American Academy of Sleep Medicine. Clinical guideline for the evaluation, management and long-term care of obstructive sleep apnea in adults. Journal of Clinical Sleep Medicine. 2009; 5(3): 263-276. American Society of Anesthesiologists Task Force on Perioperative Management of Patients with Obstructive Sleep Apnea. Practice guidelines for the perioperative management of patients with obstructive sleep apnea.Anesthesiology. 2006;104: 1081-93.